The Shrimp Shack on St Helena Island SC is the best place to try some unique fast food! The locals love this little endearing seafood place near Hunting Island State Park SC. This rustic seafood restaurant is hard to miss even if you dont quite know where to find it. On the drive out to Hunting Island SC you will see it on the right hand side of the road. A grey weathered sign announces the location with the name of the restaurant painted in bright, bold red letters. The kids will surely notice the big, rusted anchor that sits in front of the restaurant too. While the anchor is not the size seen on a whaling vessel, it will definitely get your attention. The diner is casual dining at its best and lunch time is when the food is being served fresh and piping hot. What do you need to try when you visit this place? I would suggest the iconic Shrimp Burger and sweet iced tea, but a shrimp basket is an equally pleasant and tasty treat to take with you to Hunting Island State Park SC. During the peak tourist season, which is June-August, you can treat yourself to some great deep fried seafood. The seafood is delicious and you cant get shrimp that are any fresher unless you are netting them along the waterway yourself. There are fries, hushpuppies and tangy cold slaw to round out your lunch time bonanza. This is not for those who worry about cholesterol, but if you truly want delicious fried shrimp or fish then the shack that serves it on St Helena Island SC is the place to indulge in this guilty pleasure. 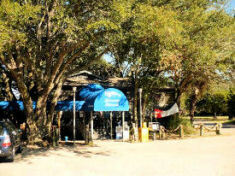 For years this weathered setting has been the one place that most Low Country beach goers stop for a fast meal. The building has been expanded over time, and you can dine on a screened porch while enjoying the view of the nearby marshlands. Families enjoy the uniquely picnic like atmosphere. Dont expect perfection or hovering waiters to greet you at this little diner, but it is a wonderful place to grab a quick, mouth watering lunch. 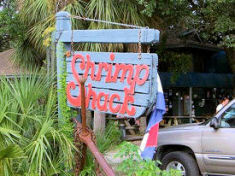 The Shrimp Shack on St Helena Island SC is worth a visit especially if youre on your way out to Hunting Island SC.